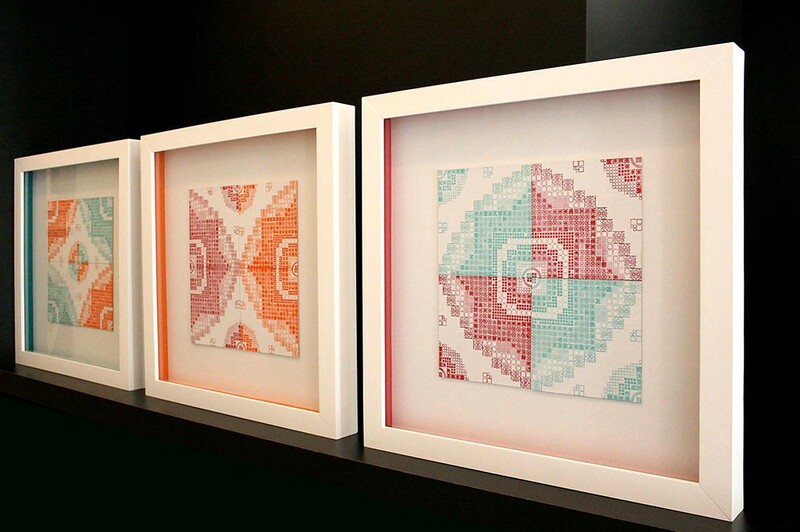 Since her Fine Art studies in Belo Horizonte (BR), Heloisa collects typographic ornaments. 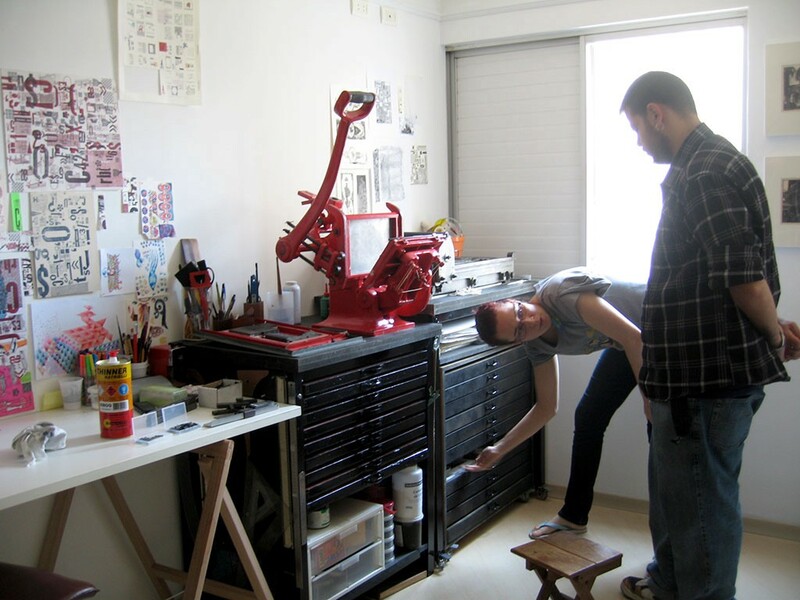 When she moved to São Paulo, one of her big concerns regarding the new home was if the building structure could support her small (and heavy) letterpress atelier. It’s the same apartment, on the 6th floor, which was our work site for 2 years, for the planning and production of the TypeTiles. Azeite de Leos with Heloísa Etelvina in her atelier in 2010. In 2013, when we were testing a workshop dynamic, the project seeds were being planted. However, at that moment the idea was only to play with the available type ornaments to assemble one layout — no defined format or theme, just one condition: no letters. 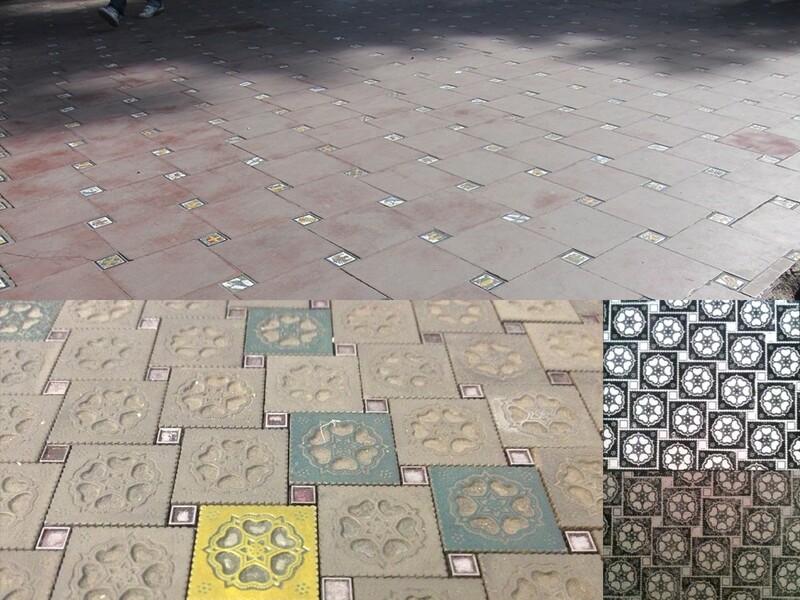 Workshop in 2013: photo of a sidewalk in Belo Horizonte as inspiration (above) and the result in type ornaments (below): matrix and print. The results from that afternoon, added to the possibility to be part of Feira Plana in the following year, encouraged us to continue this research, now in a more structured manner. 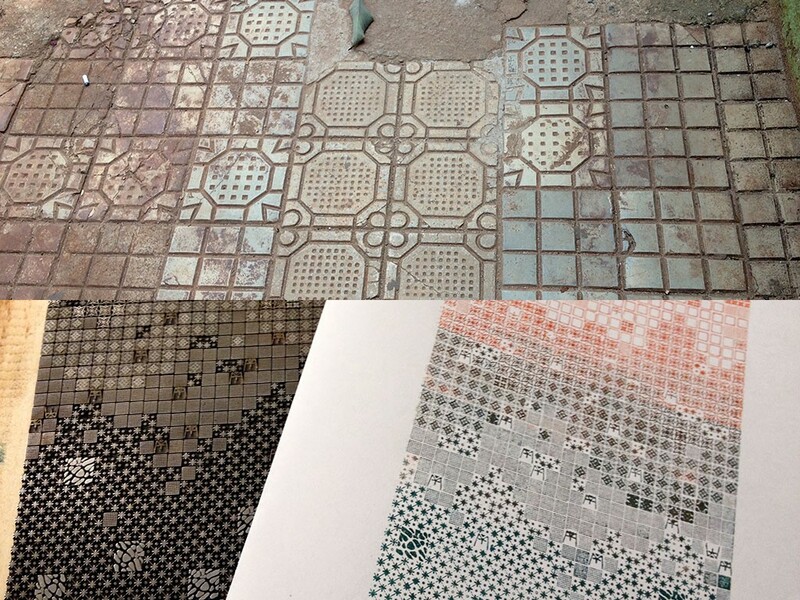 Visiting a cement tile factory and many photos from walls and floors’ coverings were part of our research, therefore it didn’t take us long to commit to the idea of composing typographic tiles and publishing them in a book that would naturally be called: TypeTiles. 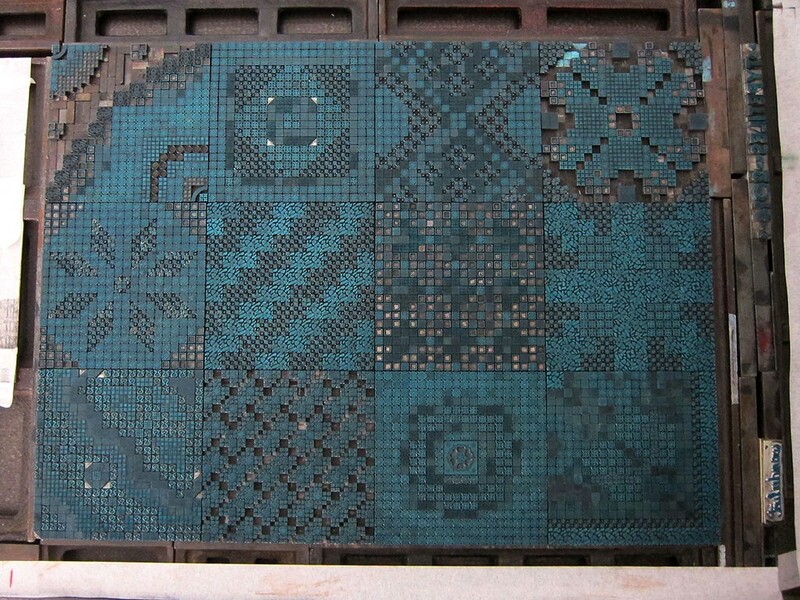 First tests: the reference of a floor in Mendonza, Argentina (above); translated to ornaments: matrix (below, left) and print (below, right). 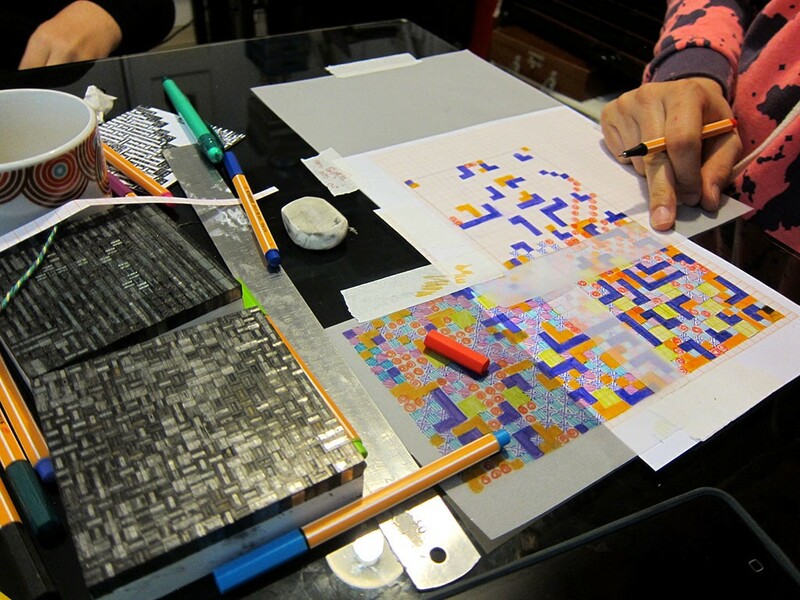 The first step was to define a formula for the book: 12 tiles of 9x9cm, printed in one color in thick cardboard paper. All the tiles were composed using mostly 12pt ornaments, forming a grid of 20x20 units, but we also used 6, 24 and 48pt ornaments. The compositions development process included many tests, breaking it all apart and starting over again. They took a lot of time, and in some cases it was very common (and slightly nerve wreaking) to dismantle the composition after the first printed test because the final result wasn’t pleasing. 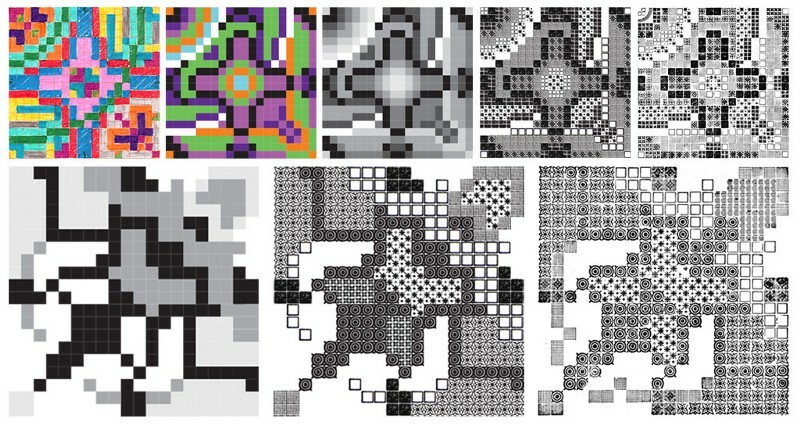 At a certain point, we had some tiles ready, when we realized they could be classified into four categories: 1) running patterns ; 2) focus in one central element; 3) pronounced diagonals and 4) “corners”, which meant symmetrical compositions in just one diagonal axis. This “discovery” in the middle of the process forced us to fill the gaps, so we defined that each category should have 3 compositions. The process in the atelier. When just a few tiles were still to be composed, we faced a new challenge: the ornaments drawers that initially seemed to be infinite, reached the limit. It was mandatory to make adaptations in the new patterns and in the already assembled ones: sometimes using white material or ornaments before “relegated”. What seemed to be a problem in the beginning turned out to be an excellent way of developing more complex layouts. The use of white material in the layouts to replace missing ornaments. Feira Plana is the biggest fair for independent publications in Brazil. During two days, the Museu da Imagem e do Som in São Paulo (MIS) is invaded by more than 9.000 people who get to see and buy the products from approximately 120 exhibitors, from all over the country. Our participation was totally dedicated to the TypeTiles project, and it was necessary to diversify the matrix applications in order to have a product line with a wide range of results and prices. The main product was, undoubtedly, the book. The idea was to produce a sturdy book, a little solid block. The edge painting had the double function of reinforcing the object’s dimensional aspect and disguising the paper irregularities. During the composition of the layouts, we had the idea of the first sub-product of this process: a second book, made by printing the back side of the matrix. 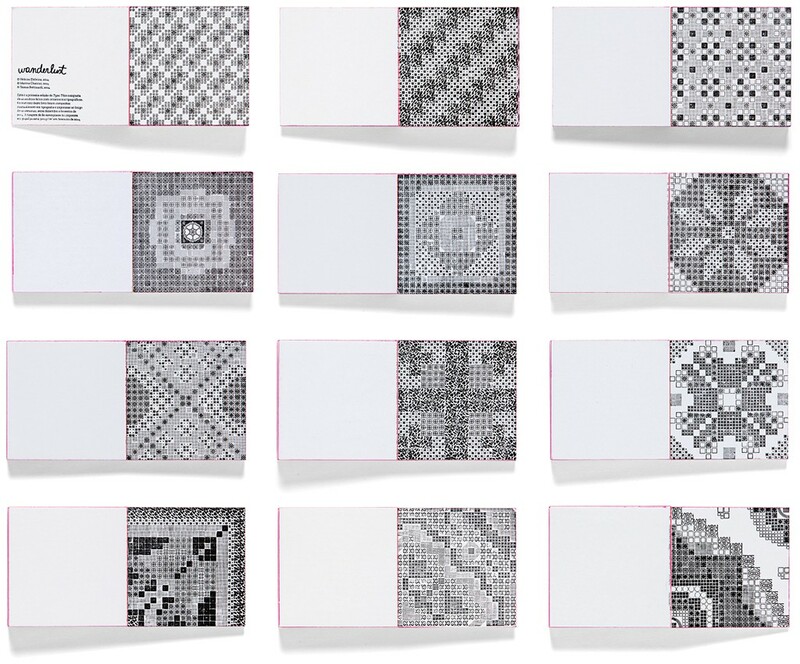 TypeTiles (front) book: 12 printed tiles. TypeTiles (back) book: 12 tiles printed from the back side of each matrix. 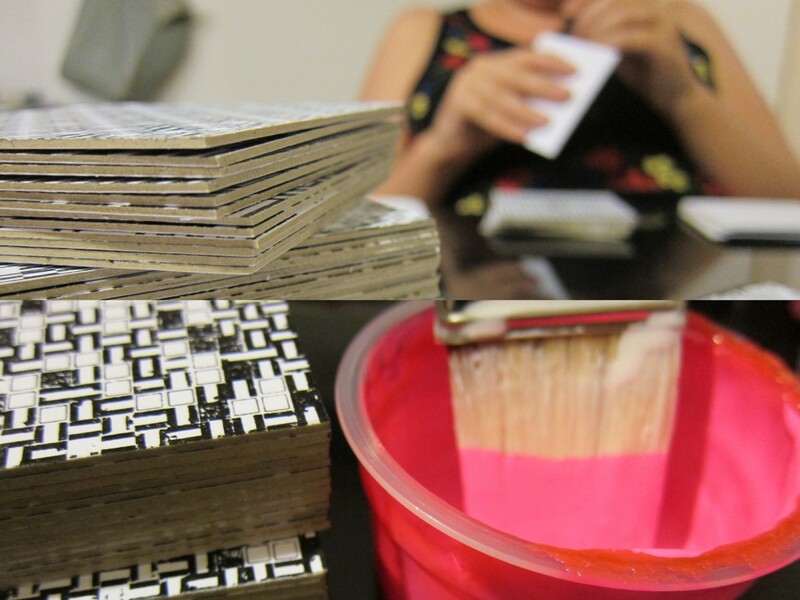 The other product was a kit containing 4 tiles, where we started to use colors. 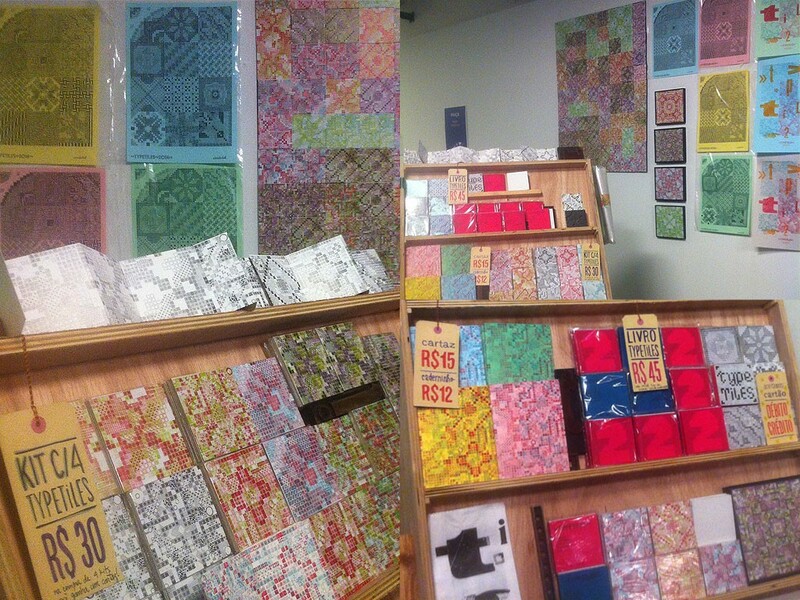 They had the same printed layout, so you could put them together in any position and have a larger pattern. 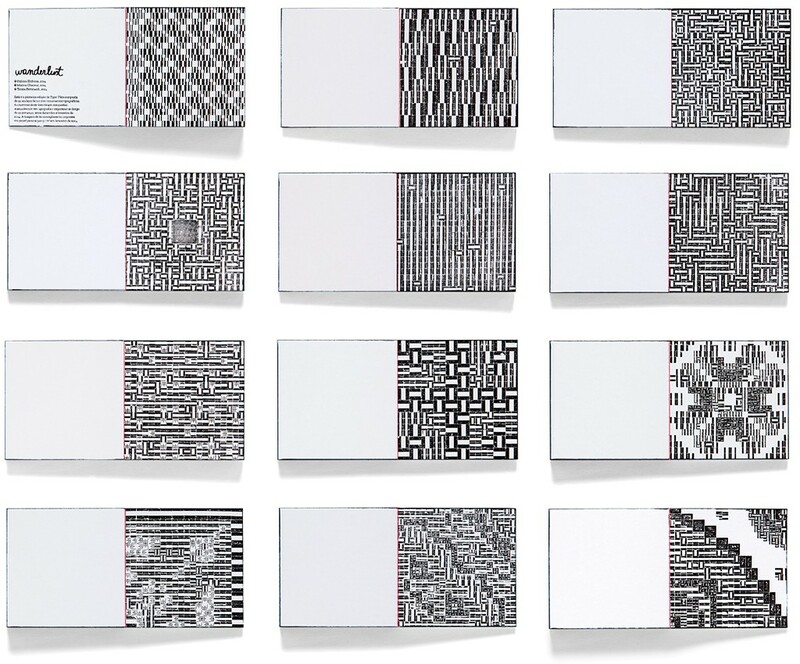 Some of them didn’t reach the three obsessive designers’ rigorous quality control, so soon they received new printed interventions to test the possibilities of overlapping patterns, and they ended up being sold as “unique pieces”, which they really were, not a single one like another. The options of “corner” tiles repeated into patterns. 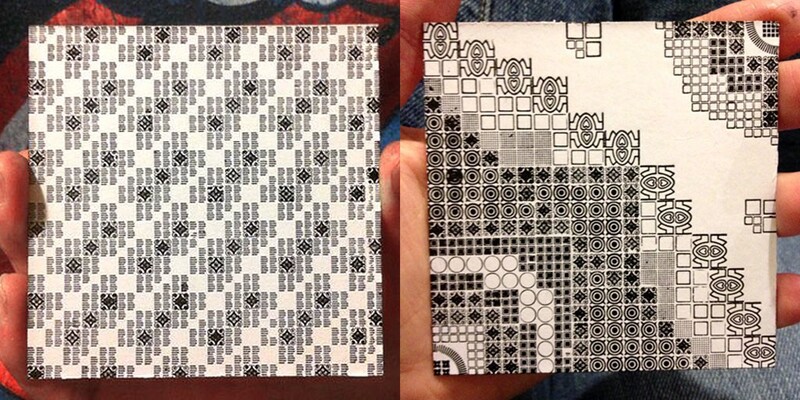 One of the “corner” tiles repeated in different colors (left) and another “corner” tile with overlapping prints from other layouts (right). 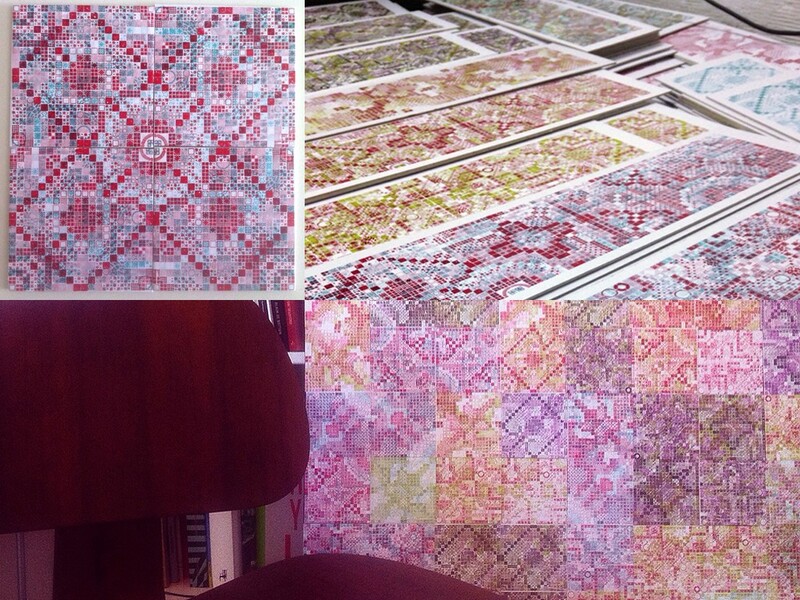 The posters were the solution to have all the tiles printed in one single sheet. Such as the books, we made the front and back versions. Besides being the project synthesis, presenting all the compositions in one single sheet, it was also the cheapest product. 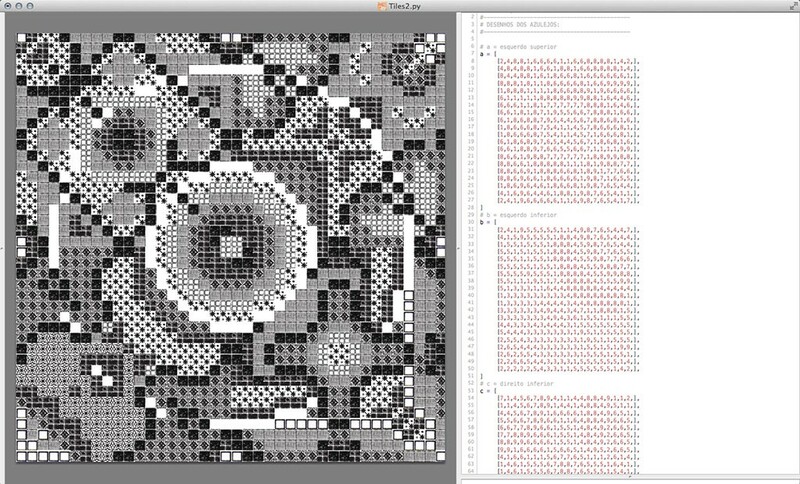 Inked matrix, ready to print the poster containing all 12 tiles. Locking up the matrix to print the poster with the back side of the 12 tiles. 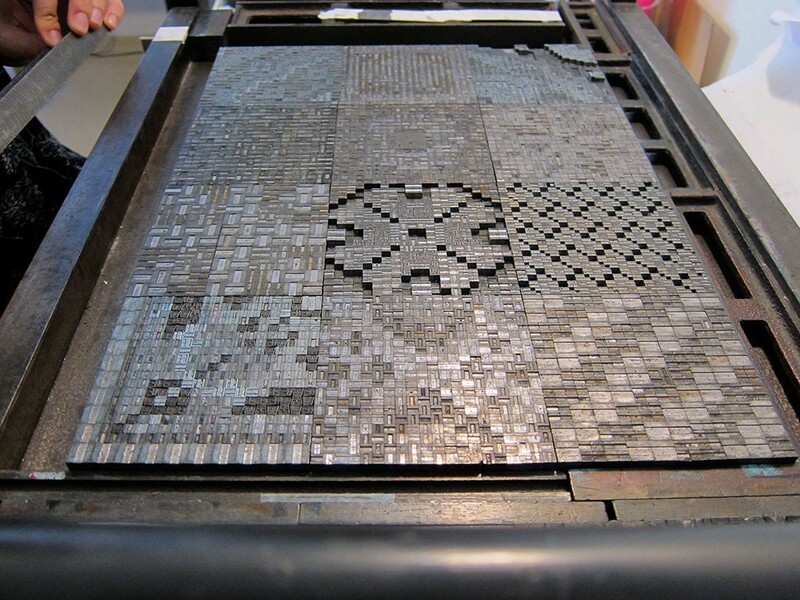 But maybe, one of the TypeTiles’ intangible “products” was the raised awareness of letterpress. Not rarely, people looked surprised — and amazed — the typographic matrix that we left on top of the table during the fair. 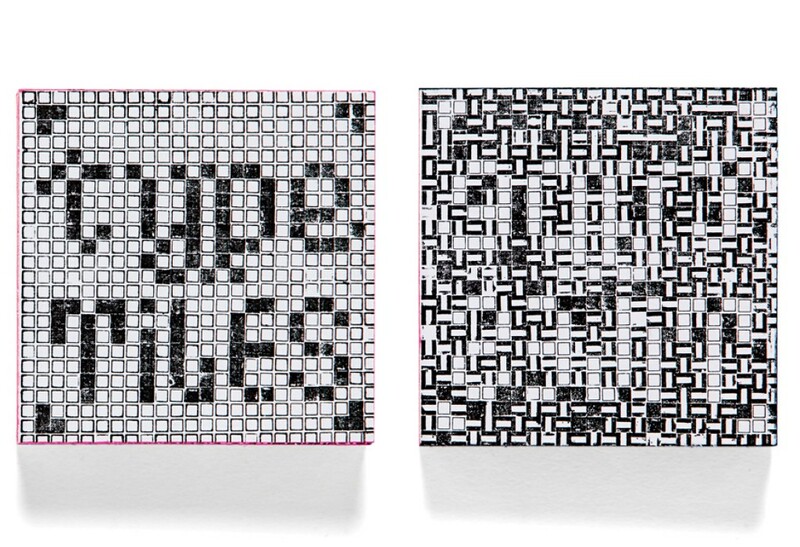 Presented as a jewel, the composition in lead was touched by people who has never had any contact with moveable type. 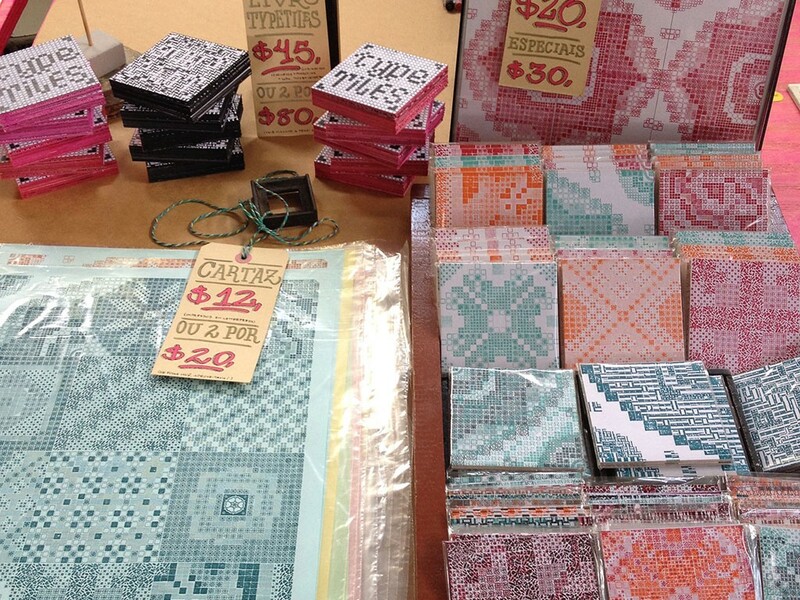 TypeTiles products at Feira Plana in 2014 at MIS in São Paulo. Frames by Moldura Minuto - Vila São Francisco in São Paulo. Planning was essential to spend less time composing the layouts, but moreover to get better formal results faster, without having to disarrange and re-assemble the compositions so many times. 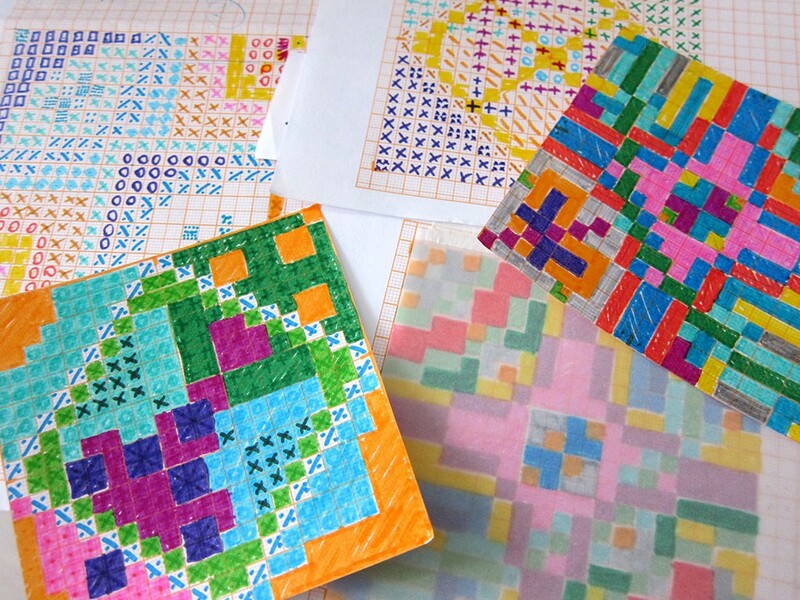 We started the studies with drafts over grid paper. For this second TypeTiles edition, it was determined that each designer would be responsible for creating four tiles. This time all of them should be “corners”, to generate a larger number of combinations — either in their own set or in a possible combination with others. In order to reach the desired effect, “connectors” would be placed in the same positions in all the matrix. 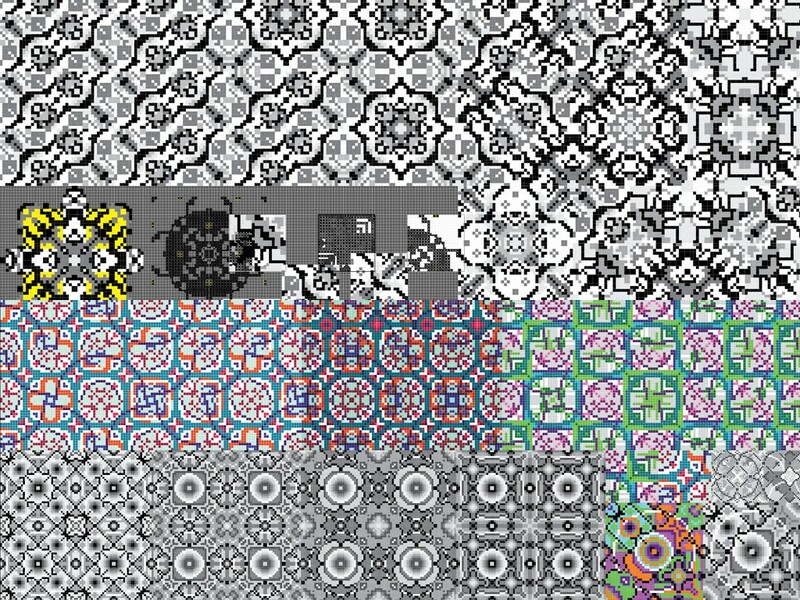 This solution was inspired by Marina’s MA research results about typographic ornaments, at MA Graphic Design (LCC) in 2005. We finally had a system! With these defined guidelines and some drafts on grid paper, we moved on to Illustrator, using colors and grey scales to represent the different ornaments. Soon we realized that it was necessary to generate a closer simulation to what would be the final result. Layout studies in Adobe Illustrator. It was helpful to this process the experience that Marina had acquired in Python programming at MA Type&Media (KABK), that was enough to create a code where it was possible to make only a few changes to test the layouts and their multiplication potentials. Thus, we eliminated the steps on infinite manual compositions, printing proofs, scanning and multiplication in Photoshop, so that we could focus on the improvement of the layouts. Each available ornament was scanned and had an assigned number. There was a basic grid of 20x20 units, and it was enough to attribute a number to each position for the ornament to appear in the indicated position. If we wanted to change the ornament, maintaining the layout, we had only to assign this number to a different ornament. In a short period of time, it was finally possible to test the layouts with different combinations of ornaments. 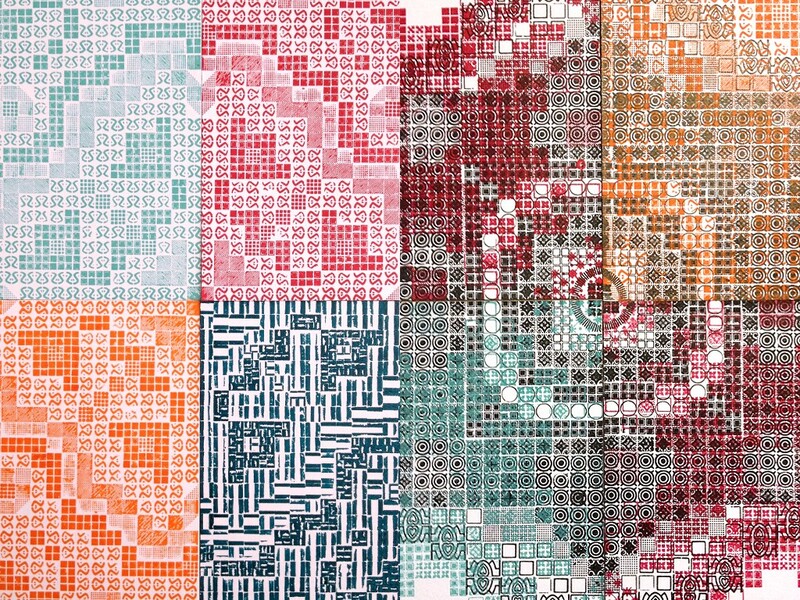 Tests of patterns generated through code and overlapping colors in Photoshop. The manual composition of the matrix was made in three different moments, respecting the rhythm of each designer. With the Python tests, after having defined the layouts, we had only to print the results from the code and use them as guides for the composition with the printing types. Although there was a plan, we had to deal again with the scarcity of certain ornaments. For this reason, another restriction was established for the project: the ornaments available in larger quantities had to be used in all the tiles/sets. 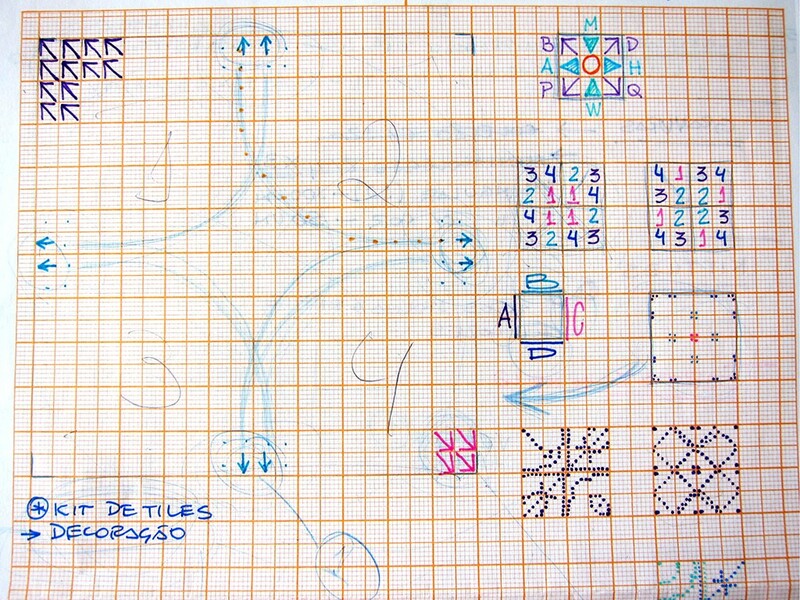 Because of this, inevitably, the initial layouts had to go through several adjustments during the process: either in the sketches on paper or the Python codes, but especially during the manual composition. Examples of the layouts development process: sketck on paper, vectors in Illustrator, test generated in Drawbot and printed result from the composition in lead type. The optimization was not only restricted to the layouts composition, but also to the printing. 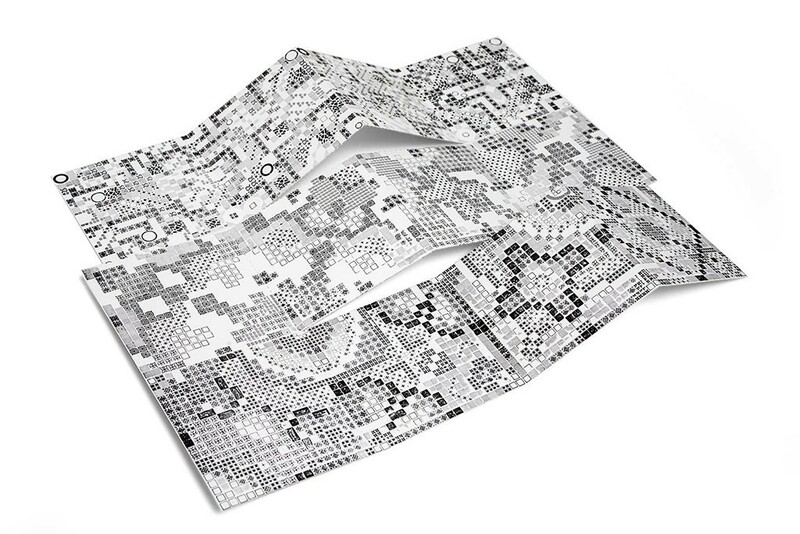 The idea of using the same matrix to print all the products — books, tiles, posters — led us to the book #2: one single printed sheet, with folds and die cuts. Regarding the kits, we had another chance to test colors and overlapping possibilities. 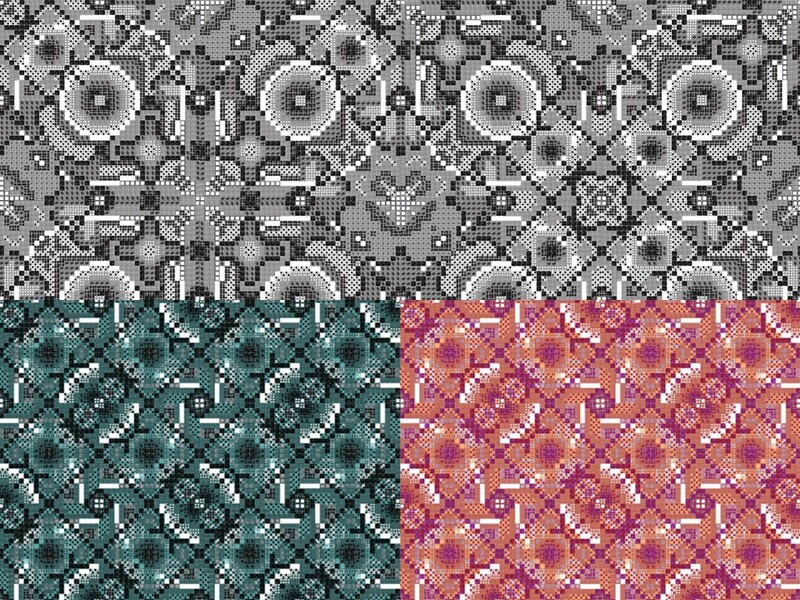 Tiles in 2 or 3 colors with overlapping prints. In order to increase production, we needed to abandon Heloisa’s proof press. In this way, 18kg of lead type were transported from São Paulo to Belo Horizonte, straight to Mercado Novo, more precisely to Bento’s print shop. It was there that he and his son printed the books, tiles and notebooks’ covers. 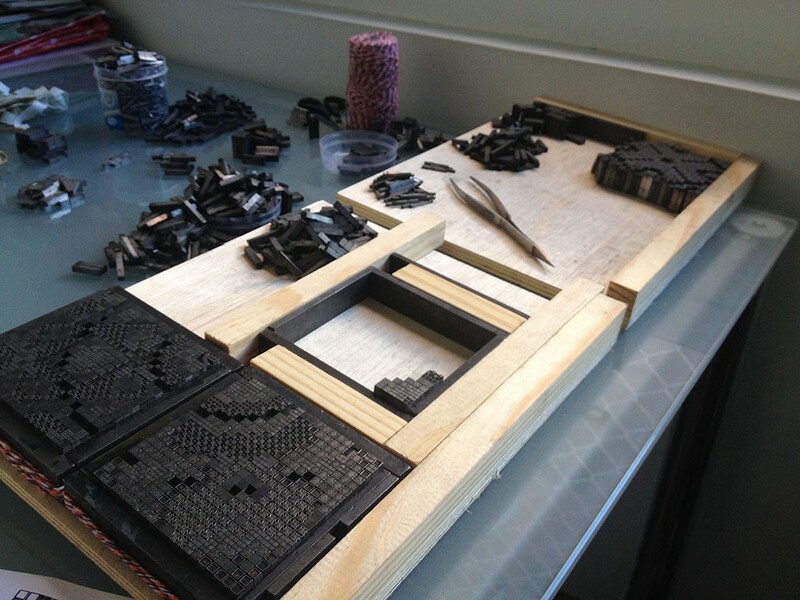 Printing TypeTiles 02 in Belo Horizonte. 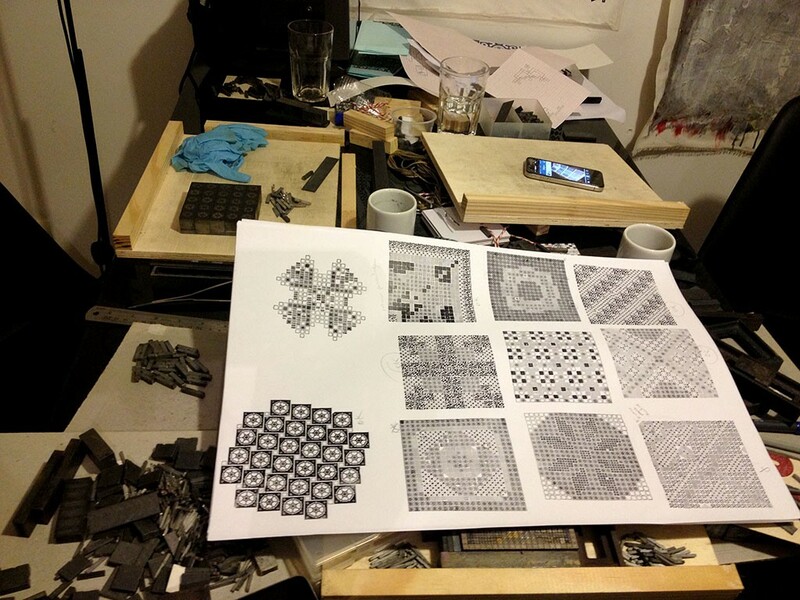 Bento’s print shop (left) and Rafael Neder locking up the poster (right). 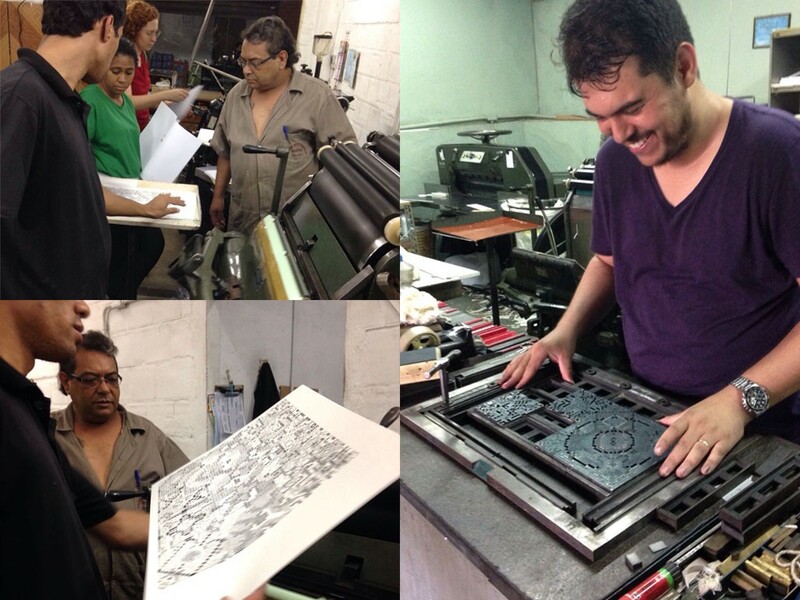 For the posters, we relied on master Matias and Rafael Neder’s extensive experience with letterpress printing. It was one afternoon filled with plenty of fun talking and printing. The posters were finalized later with one last print where all this saga started: at Heloisa’s letterpress atelier, in São Paulo, where letters and symbols were included in the layout. The results were presented at Feira Plana last March. 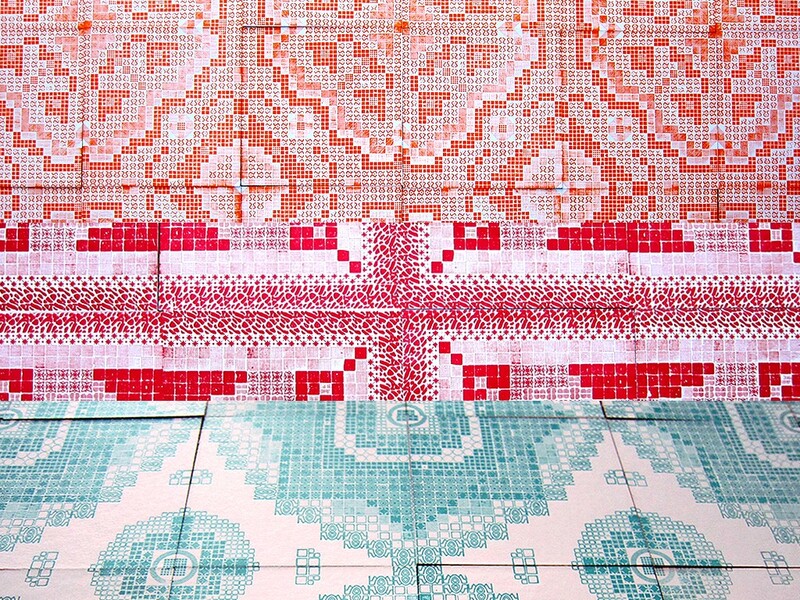 TypeTiles at Feira Plana 2015 at MIS in São Paulo. The therm “experimental” is commonly used by graphic designers to define a category of self-initiated projects “without restrictions”. However, the TypeTiles experience showed exactly the opposite: when the restrictions weren’t self-imposed, they simply imposed themselves by the circumstances. Partly due to movable types intrinsic nature, where each piece has it’s own space in that fixed grid, requiring a lot of organization and planning. Besides that, although letterpress printing has become highly popular in recent years, the type ornaments still seem to be a bit neglected, sometimes in a cruel way, being the first ones to be sold by the weight and melted. We hope that this research has contributed, in some way, to present new possibilities for the use of ornaments.